Even though I keep my diet interesting, I never get rid of simple food favorites like this easy smoked salmon bowl. It’s packed with heart healthy energy to either help me conquer the day first thing in the morning, or help me recover from an immensely busy day and/or grueling workout. 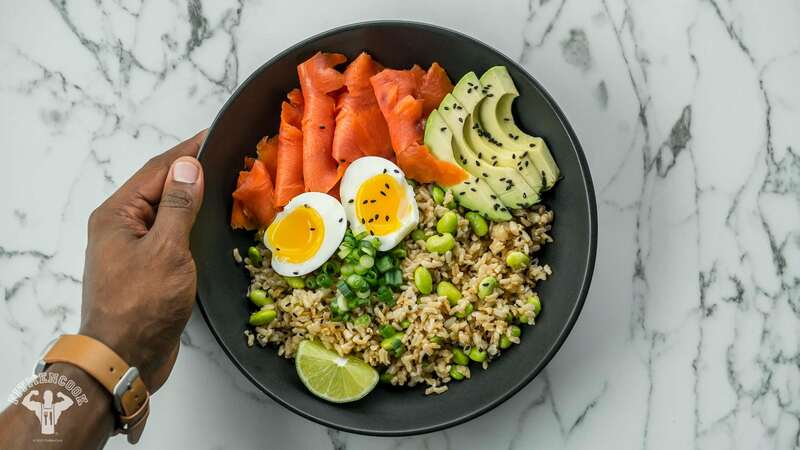 Heart Healthy Abundance = Solid protein from salmon and edamame + complex carbohydrates from brown rice (and edamame) + healthy fats from salmon and sesame. If you’re on a sodium restricted diet, then I recommend either purchasing wild salmon and smoking it on the grill or with a smoking gun; or, simply reducing the portion size of smoked salmon while also enjoying it occasionally. Boil an egg for 6 to 8 minutes for a soft-boiled egg. Note: you can boil longer if you do NOT want the yolk to be soft. Immediately place the eggs in ice water to stop it from cooking. Cook brown rice according to instructions given. When the rice is cooked and still hot, add the seasonings and frozen edamame. Mix together thoroughly until the edamame has thawed and the flavors meld together in the rice.